Welcome to the January 2016 edition of the First Monday Library Chat. This month The Recipes Project journeys to Brunswick, Maine where the Bowdoin College Library recently acquired a collection of printed American cookery books. Special Collections & Archives Outreach Fellow, Marieke Van Der Steenhoven, kindly provided an overview of the collection along with information about upcoming events highlighting the collection and information about doing research at the library. A view of the George J. Mitchell Department of Special Collections & Archives, Bowdoin College Library, Brunswick, Maine. For our readers who may not be familiar with the Bowdoin College Library, can you provide a brief overview of the library’s holdings and research strengths? The Esta Kramer Collection of American Cookery is housed here at the George J. Mitchell Department of Special Collections & Archives, a department of the Bowdoin College Library. 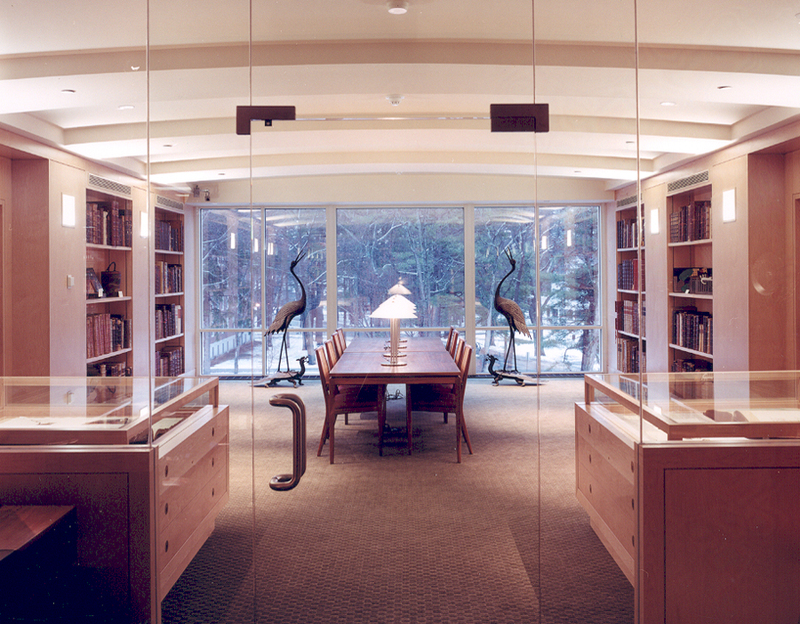 The Library supports the teaching and research of the Bowdoin community, a small liberal arts college in Maine. Our library also has branches that specialize in science, music, and art. Special Collections & Archives is an active partner in the scholarly pursuits of the College; our rare books, manuscripts, archival records, and related resources such as photographs, sound recordings, and historic newspapers, serve in teaching, learning, research, and personal enrichment. 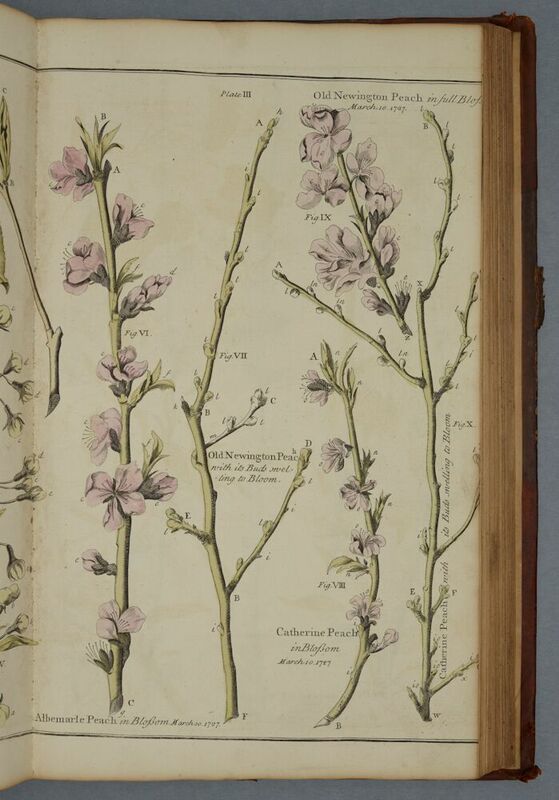 The department’s holdings are wide-ranging and include substantial collections of unique manuscript resources, over 50,000 rare books, journals, and broadsides, 25,000 photographs, as well as maps, sound recordings, and electronic records. Among the printed works (the earliest dated 1478) are collections of early American, Maine, and British imprints; books by New England writers; material by and about Nathaniel Hawthorne and Henry Wadsworth Longfellow (both Bowdoin graduates in 1825); finely printed and finely bound books; artists’ books and pop-ups; and works on travel, exploration, and natural history. Some of these books have been in the College’s possession since soon after its founding in 1794. Manuscript holdings date from as early as the 13th century and are particularly rich for research into the early history of Massachusetts and Maine; antislavery, the Civil War, and Reconstruction; Arctic studies and exploration; Maine writers; politics and government; and Bowdoin College, its alumni, faculty, and presidents. Complementing these resources are thousands of photographs and audio recordings, hundreds of maps, and a growing array of digital surrogates. 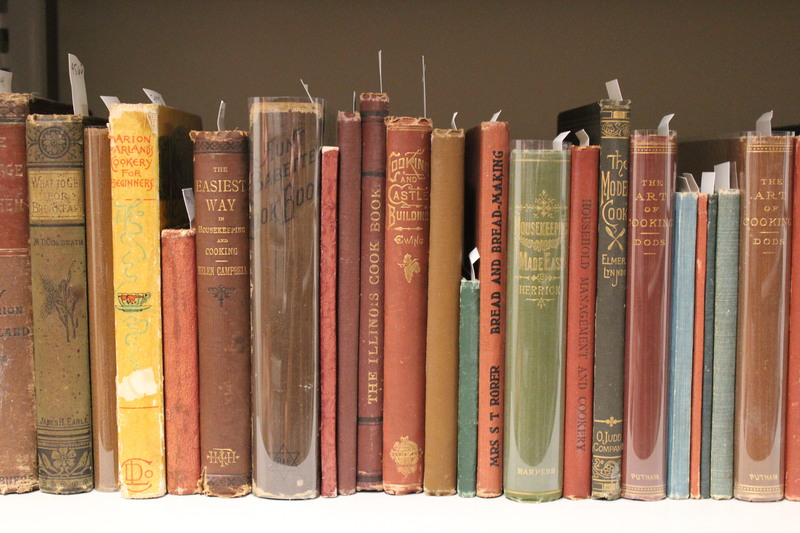 A shelf view of the Esta Kramer Collection of American Cookery at Bowdoin College Library. The Bowdoin Library recently acquired the Esta Kramer Collection of American Cookery; can you give us a broad overview of the collection’s scope? 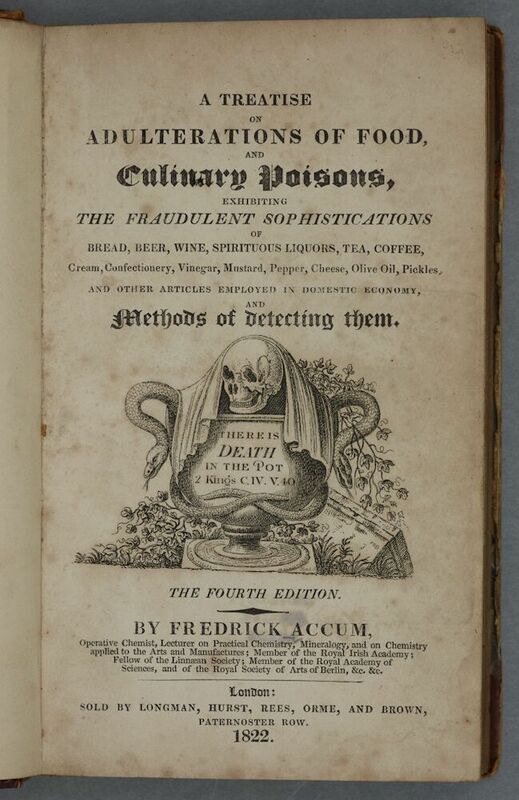 The Esta Kramer Collection of American Cookery is a comprehensive gathering of printed American cookery books, dating from the eighteenth through early twentieth century and containing more than 700 books. The strength of the collection is from the Colonial era through 1900, though important works through 1960 are integrated. The collection was assembled by Clifford Apgar and is named after Esta Kramer, who made a generous gift to Bowdoin College to enable its acquisition. As a resource for American food history, the collection represents every type and style of American cookbook to emerge between the eighteenth and twentieth centuries, which includes: cookbooks for every social and economic level, regional cuisines, quantity cooking, single subject books, cooking with few ingredients, réchauffage or cooking with leftovers, economic cooking, appliance and gadget cookery, foreign cuisines, professional chef books, banqueting, diet books, market guides, seasonal cooking, product promotion cookbooks, military cooking, vegetarianism, children’s cookbooks, and community cookbooks. Beyond cooking, the collection illuminates the development of American culture, encompassing social movements and historical events, including women’s suffrage, temperance, the African-American experience, the Civil War, the Industrial Revolution, technological applications in the household, immigration, and westward expansion. A significant number of community, church, and charitable cookbooks provide insight into local foodways, but also into women’s organizations and, through advertisements, the business communities of small and large towns across America. Can you give us a few highlights from the collection? Or, can you highlight one or two of your favorite items? It’s difficult to pick a personal favorite – but lately I’ve been utterly charmed by Housekeeping in the Blue Grass; A New and Practical Cook Book: Containing Nearly a Thousand Recipes, Many of the New and all of them tried and known to be valuable; such as have been used by the best housekeepers of Kentucky and other states. (Cincinnati: Geo. Stevens & Co.,1876) a community cookbook assembled by “The Ladies of the Presbyterian Church” in Paris, Kentucky in 1875. From The Ladies of the Presbyterian Church, Paris, Ky., Housekeeping in the Blue Grass; A New and Practical Cook Book, Fifth Thousand, (Cincinnati: Geo. Stevens & Co., 1876), Bowdoin College Library [Kramer 3964]. This community cookbook, one of many in the collection, includes recipes attributed to over 150 women from the “Blue Grass” region of Kentucky. The preface states, “It was suggested six months ago, after mature consideration of ways and means, that we might not only greatly increase our funds, but also contribute to the convenience and pleasure of housekeepers generally, by publishing a good receipt book” (v-vi). I’m drawn to this book because it’s riddled with evidence of use. The book is a great example of a make-do kitchen (vernacular) binding, in this case a hand-stitched blue gingham. Throughout the interior are food stains indicating heavily used (or at least messy) recipes. On the interleaved blanks are manuscript recipes, all in one hand, but in many different inks indicating the growth of this recipe collection over time, further supplemented by printed recipe clippings pasted down and laid in throughout. 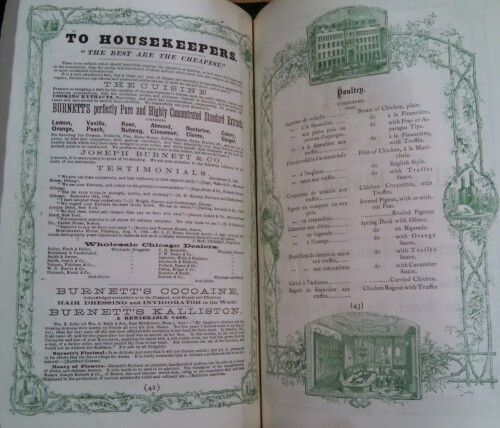 The advertisements that appear at the back of the book represent businesses both in Kentucky and Ohio, illustrating the geographical interplay between the location of writing and publication. From [Amelia Simmons, et al]. An American Orphan, American Cookery, or, The art of dressing viands, fish, poultry, and vegetables; and the best modes of making puff-pastes, pies, tarts, puddings, custards, and preserves. And all kinds of cakes, from the imperial plumb to plain cake. Adapted to this country, and all grades of life, (Poughkeepsie, NY: Paraclete Potter / P&S Potter, Printers, 1815), Bowdoin College Library [Kramer 3787]. 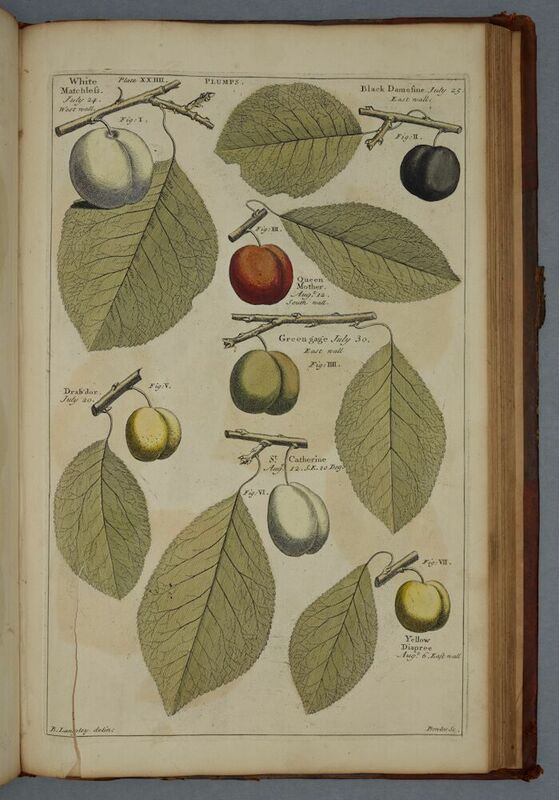 Other highlights from the collection include an early edition of Amelia Simmons’ American Cookery, or, The art of dressing viands, fish, poultry, and vegetables; and the best modes of making puff-pastes, pies, tarts, puddings, custards, and preserves. And all kinds of cakes, from the imperial plumb to plain cake. Adapted to this country, and all grades of life (Poughkeepsie, NY: Paraclete Potter / P&S Potter, Printers, 1815). First published in 1796, Simmons’ American Cookery is widely considered the first cookbook authored by an American and published in the United States. 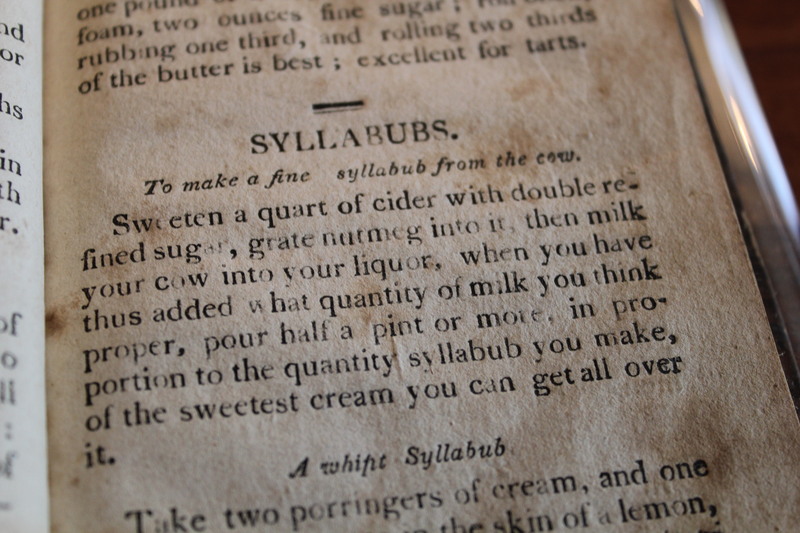 Though many of the recipes are borrowed from British cookbooks, for example Susannah Carter’s The Frugal House-wife (whose Boston imprint is the earliest in our collection), the use of native produce clues us into the true American-ness of this text. For instance, Simmons’ calls for cornmeal in five recipes and offers instructions for johnnycake, hoecake, and Indian slapjacks which are some of the first printed examples of these early American food staples. Other recipes call for cranberries and turkey, both indigenous to America. 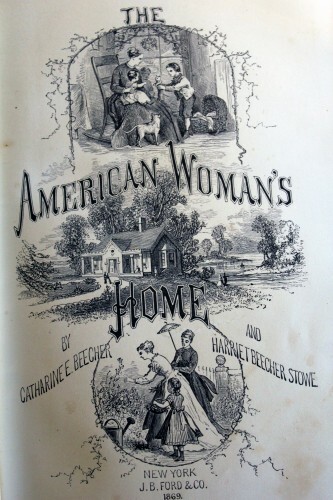 From Catharine E. Beecher and Harriet Beecher Stowe’s The American Woman’s Home: Or, principles of domestic science; being a guide to the formation and maintenance of economical healthful, beautiful, and Christian homes (New York: J.B. Ford and Company, 1869), Bowdoin College Library [Kramer 3935]. Another highlight from the collection is a first edition of Catharine E. Beecher and Harriet Beecher Stowe’s The American Woman’s Home: Or, principles of domestic science; being a guide to the formation and maintenance of economical healthful, beautiful, and Christian homes (New York: J.B. Ford and Company, 1869). This book has particular resonance for the Bowdoin community since Harriet Beecher Stowe and her sister Catharine Beecher lived in Brunswick, adjacent to campus, and the College now owns the home they lived in. While Stowe’s husband served as professor of theology at Bowdoin, she penned Uncle Tom’s Cabin and her sister assisted her with domestic duties and the care of the Stowe’s five children. Additionally the sisters ran a school from the home, which adds an interesting perspective to the principles and instruction enumerated in The American Woman’s Home (written over ten years after the Stowe’s and Beecher left Brunswick). The collection is full of wonderful and rare cookery books, these are just three examples. There are further highlights listed on our website. Bowdoin has an upcoming exhibition featuring the new collection; can you provide our readers with more information and, perhaps, a sneak peak? “What to Eat, and How to Cook It: A Celebration of the Esta Kramer Collection of American Cookery” exhibition will open on January 25, 2016 on the second floor of the Hawthorne-Longfellow Library and will be on view through June 5. To open the exhibition antiquarian bookseller and epicure Don Lindgren will explore what the physical attributes of cookbooks can tell us about our social, cultural, and environmental past in a talk entitled “The Anatomy of the Cookbook” on Wednesday, January 27th at 4:30pm. This talk is open to the public and will also be livestreamed. A reception immediately follows at the Hawthorne-Longfellow Library where Bowdoin Dining Services will be serving hors d’oeuvres based on recipes from the collection. As the first formal introduction of the Esta Kramer Collection of American Cookery the exhibition will offer a tantalizing glimpse into the collection while celebrating its acquisition. 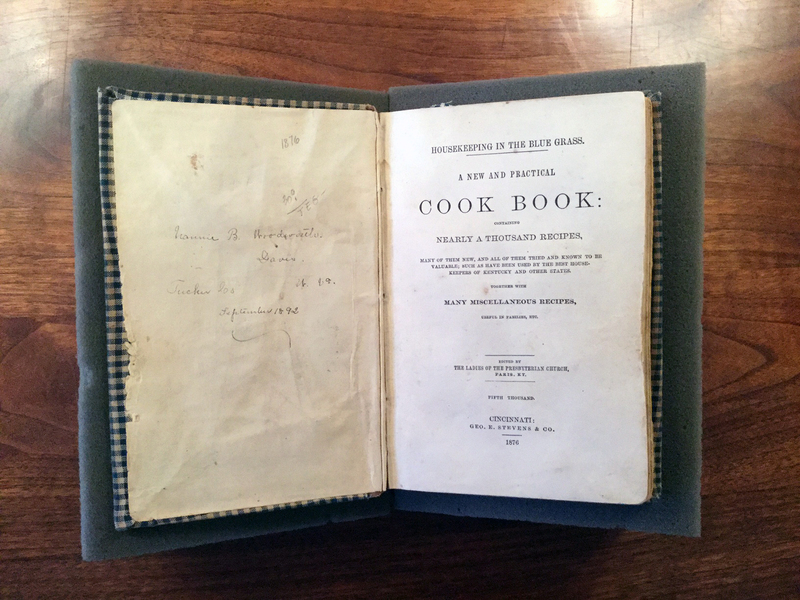 We will feature cookery books spanning two hundred years and which will be presented along with archival material about the history of food and dining at Bowdoin. For many years, Bowdoin has been at (or near) the top of the “Best Food” Princeton Review college rankings and we’re excited to showcase what the College has been eating historically, and how it was cooked! Through illustrations, narratives, and recipes, the exhibition explores how Americans have thought about, prepared, and consumed food from the Colonial period to today. “What to Eat, and How to Cook It” will explore new ways of experiencing cookbooks, looking at what they can tell us about advances in technology, social movements, historical events, issues of race and gender, and place/regionalism. The collection has yet to be formally processed – but we do have an inventory of the collection available online and further bibliographic content available by request. We are also happy to offer reference services to connect specific research inquiries to relevant materials in our collections, either in person or by correspondence. For those who are able to travel to Brunswick, Maine, we welcome all to our reading room that is open 9:00 a.m. to 5:00 p.m., Monday-Friday, major holidays excepted. Maine has an especially rich food culture, from the incredible coastal resources to a thriving agricultural economy (both historically and now), and we are thrilled to add a new dimension to that culture through public access to the Esta Kramer Collection of American Cookery. Can you tell us a little more about the archive collections held at the Royal College of Surgeons of England? The Royal College of Surgeons of England has been creating its own archives since its foundation in 1800. It has also collected archives created by and for surgeons with many pre-dating the College, going back to its predecessor the Company of Surgeons (1745-1800). The institutional archives document the College’s activities and its initiatives to support and develop the surgical profession. Unfortunately the College was hit be a number of incendiary devices in 1941 so there are significant gaps. The other “deposited” archives relate to medicine and surgery from the 16th to the 21st centuries, including personal papers, case notes, diaries and photographs. Our collection policy now focuses on significant advances in surgery and surgeons who have made those advances or played key roles in the work of the College but was previously broader than that. How does a surgical archive come to have recipe books in their collections and do they get used by researchers? 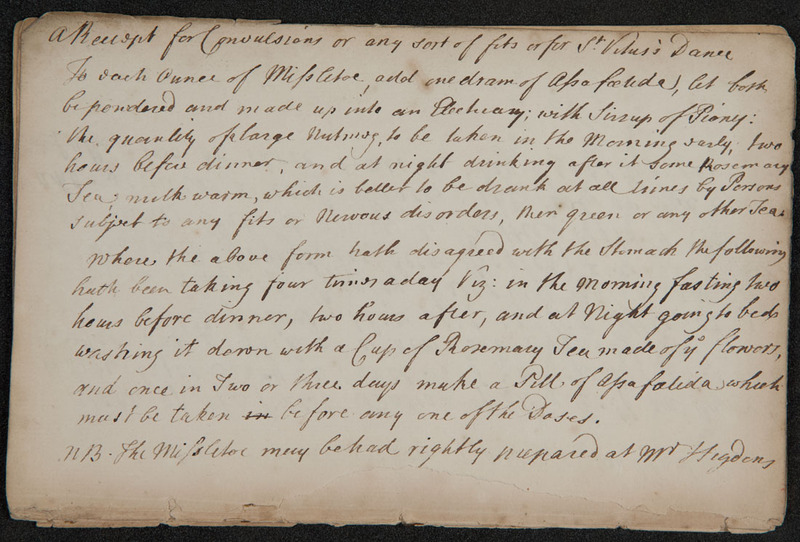 As with so many other archives, we often don’t know how we come to have the recipe books in our collections. Many of the earlier accessions, including the recipe books, were usually donations from Members and Fellows of the College. The recipe books are certainly not the only non-surgical items that we have amongst our deposited collections. There are also the attendance books of various social groups such as the Western Friendly Medical Group who met to dine and play cards in the 19th and 20th centuries. We have a volume of letters to and from Rudyard Kipling, some illustrated by Edward Burne-Jones, due to his friendship with a former President of the College. Due to their purpose, the recipe books are often in very poor condition through repeated handling while in use so we have made a number of them candidates on our Conserve our Collections scheme. Through kind donations we have such items conserved so that they survive for future generations to wonder at the recipes for “the green sickness”, consumption and the King’s Evil amongst others. Can you give us a few highlights from your collection, or tell us about some lesser known recipes? 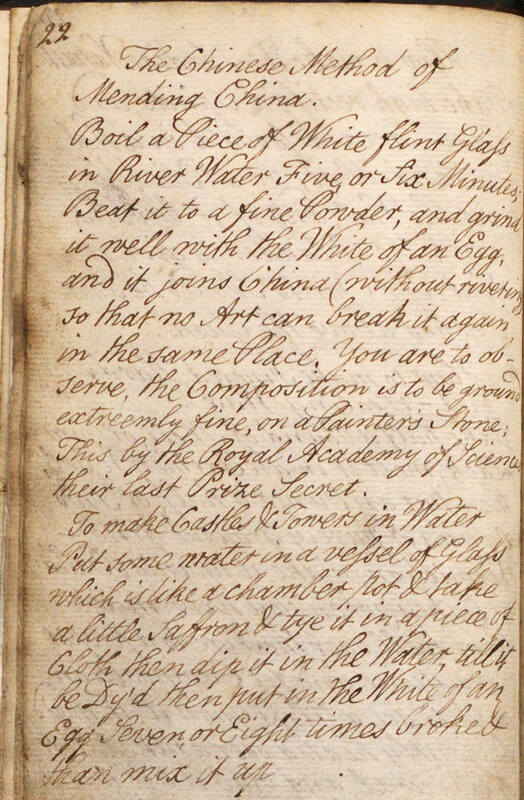 Although the archives at the Royal College of Surgeons of England only contain a small collection of recipe books, with the majority dating from the Eighteenth Century, they do contain an amazing variety of food recipes and medicinal and household cures. We’ll discuss a small selection of these to give you a flavour of the diversity that there is. We have also selected some just because they are fascinating or particular favourites of ours. This is a small bound manuscript from the Seventeenth Century containing a variety of recipes for both ailments and food. Here is an example of a food recipe, beautifully written, for making macaroons. This Eighteenth Century volume offers the reader some fascinating recipes including this one for making hair grow on any part of the body with its curious use of dried bees! From the same volume comes this household recipe to mend china using the “Chinese Method”. This is a particularly interesting item which came to us consisting of 12 unbound pages of manuscript. Written in several hands, it includes recipes for making Friars liquid balsam and cures for asthma, cough, convulsions, jaundice and piles. This recipe below, taken from this volume, uses mistletoe as the main ingredient as this was thought to alleviate convulsions. The volume contains a book of “Receipts” initially compiled by Sydney Humphryes. The recipes include treatments for various conditions including burns, vomiting, the plague, scrofula, as well as fruit waters and hair dyes. 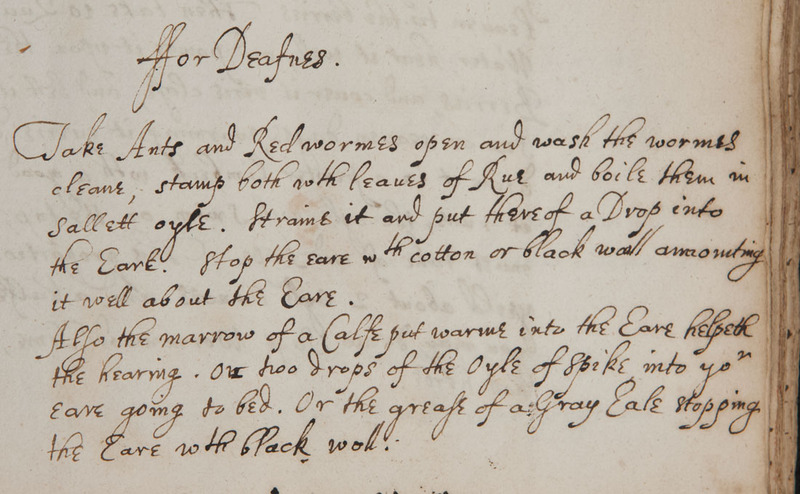 Two particular favourites are the ones below; a cure for deafness which uses ants and red worms and one for staunching bleeding which has chimney soot as a vital ingredient! 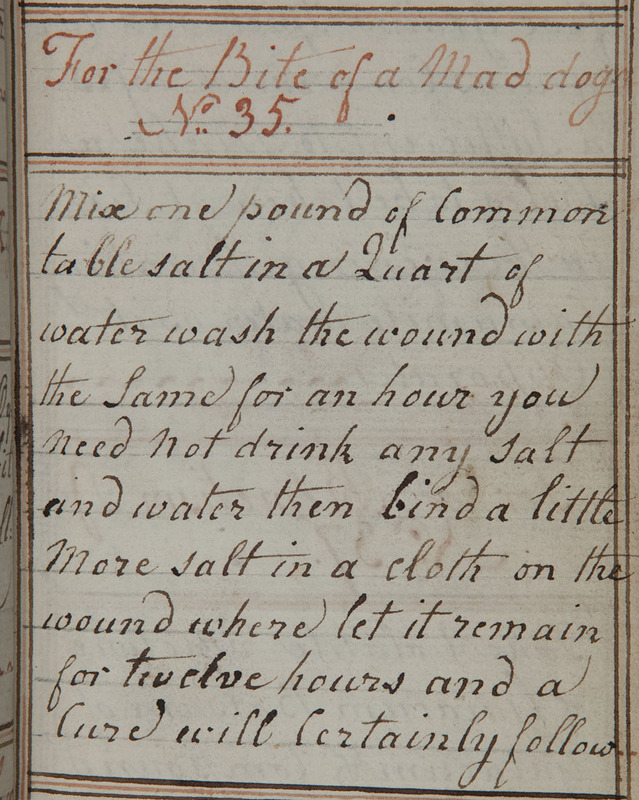 This volume contains many recipes which might still be appropriate today such as using elderflower to make an eye solution and saltwater to clean a wound, as illustrated below in this cure for the bite of a mad dog. Users can find our catalogue at: http://surgicat.rcseng.ac.uk/ A simple search using “recipe” as a search term will produce all the items relevant to this collection. By clicking on the record it is then possible to see fuller details about the item. We were lucky enough to have had a long-term volunteer, who was particularly interested in our recipes, list them in detail. It is now possible to use these lists to search for specific recipes, making the job of a researcher a little easier. We are happy to make these lists available on request. Anyone wanting to see one or more of the recipe books does need to make an appointment by emailing us Archives@rcseng.ac.uk. The Newberry Library is an independent research library in Chicago. Open freely to the public, the library is dedicated to the advancement and dissemination of knowledge, especially in the humanities. Today I’m talking with Will Hansen, Director of Reader Services and Curator of Americana. 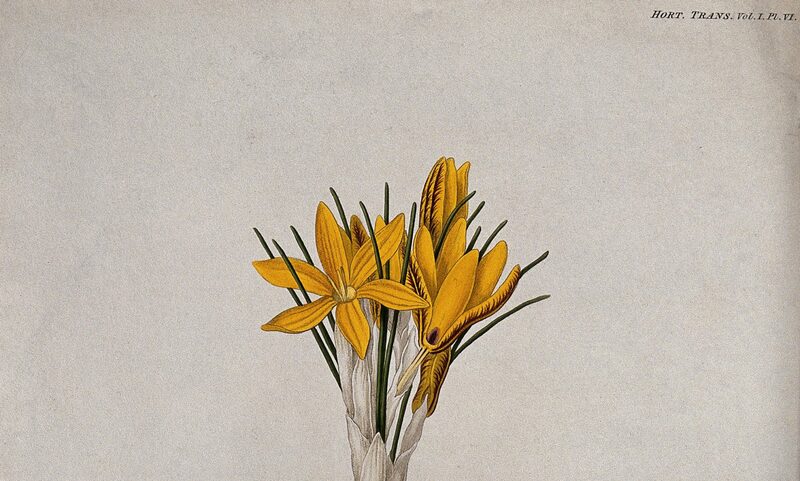 Can you give us an overview of the Newberry’s collection strengths? The Newberry is a research library focused on the humanities disciplines; we acquire and preserve a broad array of books, manuscripts, maps, and other materials relating to the civilizations of Europe and the Americas. We focus our collecting on original or primary source materials in a number of core collecting areas, including American history and culture; American Indian and indigenous studies; Chicago and the Midwest; genealogy and local history; the history of the book; maps, travel, and exploration; medieval, Renaissance, and early modern studies; music; and religion. Our collections encompass, in very approximate numbers, 1.5 million books, 5 million items in manuscript and archival collections, and 500,000 maps. More information is available on the Core Collections page of our website. What online catalogs and digital resources can the Newberry offer to off-site researchers? The best places to start research in the Newberry’s collections are our online catalog and the Modern Manuscripts and Ephemera page for searching or browsing inventories and abstracts of over 800 collections from the mid-18th to 20th centuries. We also provide a variety of research guides to help readers find material in a wide variety of topics in our collections. In addition, the Newberry provides many digital resources and publications featuring digitized materials from its collections. These range from large-scale digitization projects to digital versions of exhibitions to interpretive digital humanities projects. Finally, our Digital Collections for the Classroom provide digitized primary sources with contextual materials for use by teachers and students in primary and secondary educational settings. Our blog readers are interested in historical recipes to learn more about the history of food, magic, art, science and medicine. As the Curator of Americana, can you tell me what relevant materials we could find in your collection? Cookbooks and related materials have not been a major collecting focus in the Newberry’s history, but many great items have come to us thanks to connections with other collecting interests. 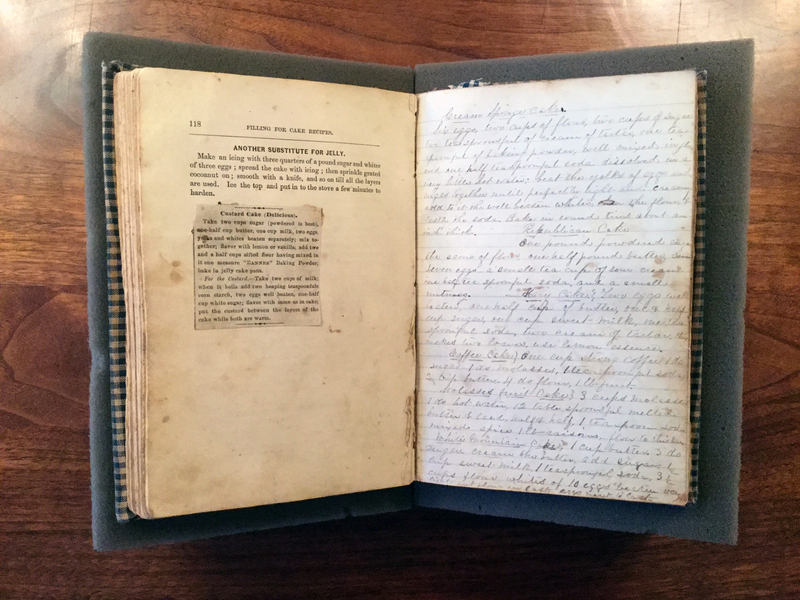 The Edward E. Ayer collection, focused on the history and culture of Indians of North and South America, includes a manuscript “Schedule and catalogue of some Indian receipts & cures” compiled by Daniel D. Rogers, a resident of Stillwater, NY, in 1828-1838. It contains 269 American Indian and other recipes and cures. The Newberry also holds some rarities related to Chicago’s culinary history. Of particular note are the 88-page menu and description of Kinsley’s, thought to be the city’s finest restaurant, in 1867; and the only known copy of Isaac A. Pool’s The Cake Baker, published in Chicago in 1857–perhaps the first cookbook published west of Indiana. Both are the only copy located in a search of the WorldCat database. Another great rarity related to Chicago’s printing history is a series of promotional booklets showing the capabilities of R. R. Donnelley and Sons, a Chicago-based printer and publisher, to create high-quality cookbooks in the 1930s. R. R. Donnelley and Sons, Lemon Pies or Wash Tubs (Chicago: 1934-1938). Pictured here are promotional materials for Omar Blue Ribbon flour. Of some tangential interest might be the many items related to livestock, cattle brands, and the like in the Newberry’s Everett D. Graff collection, focused on the westward expansion of the United States. Are there other collections across the Newberry where our readers might find relevant materials? There certainly are. Jean S. Gottlieb’s published Checklist of the Newberry Library’s Printed Books in Science, Medicine, Technology, and the Pseudosciences ca. 1460-1750 is a good place to start for an overview of our early, chiefly European, holdings of rare books in these fields. 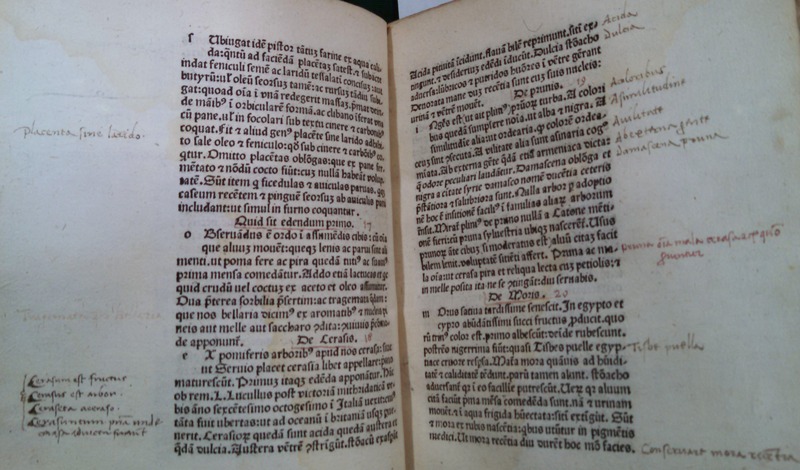 They include some early cookery highlights, such as the 1480 (Cividale) and 1494 (Venice) editions of the first printed cookbook, Platina’s De Honesta Voluptate. 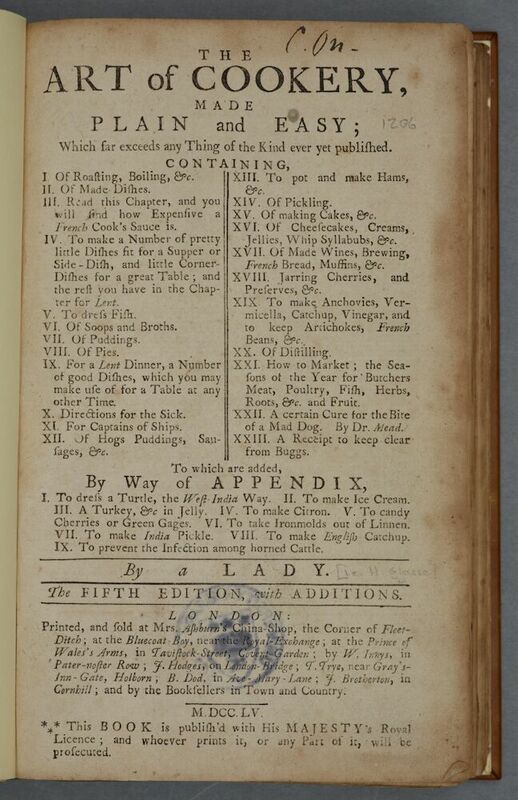 The Newberry also holds a number of the major early English cookbooks of the eighteenth century, such as the 1771 second edition of Elizabeth Raffald’s Experienced English Housekeeper. 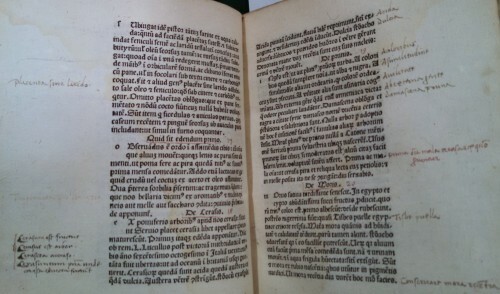 Platina, De Honesta Voluptate (Cividale, Italy: 1480), with marginalia by an early reader. 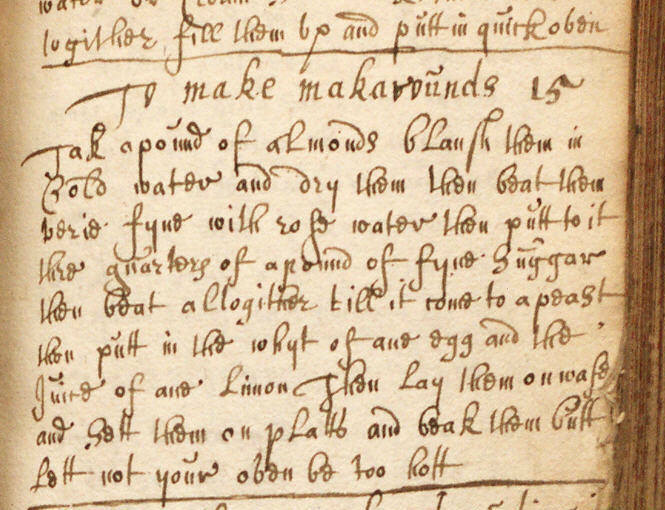 We also hold a number of early manuscripts that contain medicinal and workshop formulae or recipes, dating back as far as the fourteenth century. A fifteenth-century Italian manuscript focuses on recipes and instructions for making inks, pigments, glue, and other materials related to book production—part of our great collections for the history of printing and the book. Another charming example is a 1591 English law text, Les Tenures de Monsieur Littleton, reused as a commonplace-book in the eighteenth and nineteenth centuries, including manuscript recipes for glue, pickles, gooseberry vinegar, blacking polish, orange and cowslip wines, red currant jelly, cough syrup for whooping cough, and a tonic for consumption. If our readers want to go to Chicago to use your materials, does the Newberry offer any fellowships or travel grants they should know about? The Newberry has an active and robust fellowship program, supporting visits from one month to a full year. Information can be found on our Fellowships page on our website. We are also a new member of the Consortium for the History of Science, Technology, and Medicine, which offers its own consortial fellowships. Access to our collections is free and open to members of the public over 16 years of age with a research interest supported by the collections. Thanks, Will, for chatting with me! If you have additional questions about the Newberry Library, you can email Will Hansen.